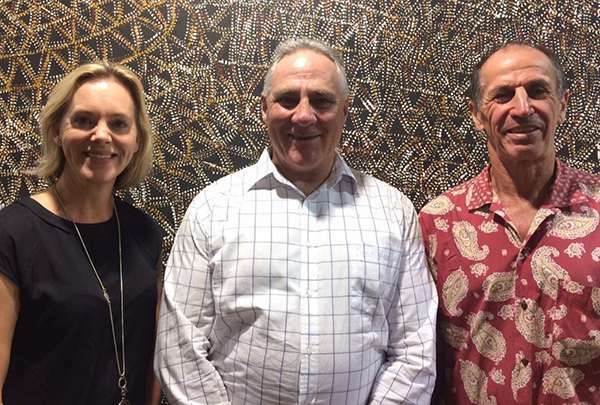 CEO Shane Kimpton and Pre-contracts Manager Jennifer McIlveen were lucky enough to visit the Yirringinkiri Pwoja exhibition at Hilton Double Tree in Darwin this week, where they met with Munupi Art Centre Manager Guy Allain. A collaboration between three Tiwi art centres; Munupi Arts, Jilamara Arts & Crafts Association and Ngaruwanajirri Inc., the exhibition showcased Tiwi singing, dancing and artwork. Located on Melville Island, the Munupi Art Centre provides a great opportunity for visitors to share in the culture of the Tiwi people and learn more about the local community. For more information on the art centre, click here.